We've all got stamps kickin' around in our stash. Many scrappers are caught in the line of thinking that stamps are for cards....not so I say! You can use stamps on your layout to make fun, unique embellishments. I stamped some images onto the Pink Paislee paper, then cut them out. I overlapped them and created a really fun "cluster" of flowers on my page. I threw some Helmar Liquid Scrapdots in there to vary the heights of my flowers. So get your stamps out girls, and rediscover the fun of stamping on your layouts. Well, I am proud to announce my latest endeavor. A few months back I was contacted to create an album to be presented to the President of the United States, Barack Obama and First Lady Michelle Obama. Yes, I was stunned and taken aback as this job seemed a bit too daunting to under-take. I still am pinching myself but I had to dig my creative heels in and figure out how to pull this one out of my hat. The album is to commemorate the National Call To Service event that occurred on January 19, 2009 on the USS Midway. I am so excited to show you the album that will be presented to President Obama in early May. Click HERE to see the slide show full screen. Check out www.tracyweinzapfelstudios.com for more details. Thank you Helmar for donating the adhesives to make this album possible. Gee, it has been a crazy couple of months and hard not to scream from the rooftops. Now I am hoping that our President and First Lady like this album that commemorates an amazing organization and event...and now this tired artist may finally get some rest. I hope everyone is finally getting to enjoy some Spring weather - it finally seems to have appeared here in Central Illinois and I am so very ready, lol! Today I want to share a birdhouse frame I used several different Helmar products on for different techniques so bear with me while I try to give you the scoop! I purchased this unfinished wood frame (isn't it adorable!) from a craft store and in taking off the perch, it broke. I always remove perches from birdhouses I am altering (and I alter a LOT of them, which is why I fell in love with the frame!) because it really makes covering the front with paper much easier. After you've finished papering, simply run your finger across it to find the indentation from the perch hole and use an embossing tool to neatly poke back through the paper. A drop of Helmar Premium Craft Glue, re-insert the perch and voila! So anyways, back to my poor, broken frame. I live about 45 minutes away from the craft store and already had my heart set on altering this particular frame and had zero intentions of waiting until I could get another. So Helmar 450 Quick Dry Adhesive to the rescue! While that was drying, I went ahead and painted my edges, roof overhangs, and perch. Then I used an adorable paper from Karen Foster's Spring collection - I am so in love with this line - to cover the front of the frame and a coordinating paper for the roof using Helmar Professional Acid Free Glue. I already knew I was going to be using several of the stickers from the line and stuck those down onto some white cardstock and trimmed them with a tiny border. I know, I know, they're stickers - why not just stick them on? Well first, because on an altered project, I never, ever trust the original sticker adhesive. Some are fine, some are not - I'd rather not find out when my project is hanging on the wall or something that the sticker adhesive was lousy. So for all stickers, I either mat them like this, or at least "de-stickify" them and then use an adhesive I know I can trust. In this case, I used Helmar Liquid Scrap Dots because I wanted some dimension. Because I also make jewelry, I have tons of beads hanging around and love to incorporate them into my papercrafting as well. Seed beads are an especially fun crossover product because of the massive array of colors available. Seed beads come packaged in two ways. The most common in craft stores is to have the beads loose in a vial, bag, etc. Which will leave the most patient crafter pulling their hair out and chasing after them all over the floor. So instead, try to find them "packaged" in what is called a hank. In this method, they are pre-strung onto thin cotton cords and looped into groups of around 20 or so long strands. Trust me - once you try working with them this way, you will NEVER look at a bag or vial of beads again! When beading, you simply pull one strand loose and slide them directly from the string onto your needle or wire. But we're not beading, right? Of course not - this technique I'm about to show you is so much more fun (and easier, lol)! Using Helmar Premium Craft Glue and a string of seed beads, you can literally draw with beads! First of all, a tip. The Premium Craft Glue dries quickly so a "skin" forms almost immediately - work in small (about an inch at a time, tops) increments or the beads will not stick once the skin has formed. You can lightly sketch out your path first with pencil, however I just winged it (pun intended) and went right to the fun part. Separate out one strand of seed beads from the hank and have it ready. Draw with Helmar Premium Craft Glue and immediately place the string of beads into it. Using a needle tool or detail tweezers, nudge it exactly where you want it. Draw the next section and continue. When everything is just right, you can remove the string by gently pulling. Or you can also leave the string in! I did that with the sign border so that if any of the beads got knocked loose, I won't lose them because they'll still be held there by the string! I had so much fun with this technique and now I'm eyeing the huge collection of seed bead hanks I have and thinking of all the things I want to do with them! Because honestly, I just don't have the patience to actually BEAD with them, lol - I just buy them because I love how they look hanging all together in all their gorgeous colors! The last little detail I want to mention is the sign post. Recognize it? I simply took a piece of tan Magic Mesh and folded it several times. Then I ran a line of Helmar 450 Quick Dry Adhesive along it and pressed it onto my project. I love that it added such a subtle little texture to that corner mixed in with the bright shiny beads and the pretty, muted colors of the cardstock stickers from Karen Foster. We would LOVE to see what you do with Helmar adhesives and seed beads (and any other projects with Helmar adhesives!) so be sure to let us know what you're making! Have a wonderful week! Not a scrapper? No worries! Helmar Products are for everyone - you don't have to be a scrapbooker, cardmaker or alterer to use them. In fact, you don't even really need to be a "crafter"...even if you've never crafted before, this is a fun and easy project you can do in just a few minutes. Take a small canvas panel, available at your local art supply store for about 50 cents. Print out a photograph. I wanted mine to be a little more "arty", so I used the "pencil sketch" filter in Photoshop to make the picture look like a drawing. Apply a thin layer of Textured Effects to the canvas then place your photo on top. Apply a thin layer of Textured Effects over the photo. Let it dry for 10-15 minutes. Using a paint brush with good bristles, apply a thicker layer of Textured Effects over the photo - make sure that you get lots of brush strokes in there! The result, is a photo that looks like a painting! I sprinkled some loose Stampendous glitter over the top while the Textured Effects was still wet to give it a little extra "Pop". Leave the canvas panel plain like I did for a more "classic" look, or dress it up with ribbon or embellisments. You can even put some magnetic strips on the back and make a fun refridgerator magnet. Look for Textured Effects wherever Helmar Products are sold. Create this yummy album using Pink Paislee’s Sweet Cakes Collection, Clear Scraps Acrylic Album and Helmar Adhesives. Now that we are experiencing beautiful spring weather I’ve created a bright cheerful album to suite the season. The instructions appear to be long but rest assured its quick n’ easy to make. It’s really easy when you use a complete collection such as the one provided by Pink Paislee. Thus allowing you plenty of time to enjoy the great outdoors! 1. Cut out the cupcake designs from the Pink Paislee Sweet Cakes 12 x 12 pattern papers. Embellish the cupcake with beads and a button using Helmar Premium Craft Glue. Set aside for now. 2. Cut the Pink Paislee Sweet Cakes pattern papers in 5 x 5” squares, you will need 6 squares. 3. Punch out the Pink Paislee Topsiders stickers and attach to the chipboard shapes. 4. Cut out the 12 x 12 Pink Paislee Postcard designs. 5. Fold the bottom of the paper bag to create a pocket using Helmar Premium Craft Glue, leave the top of the bag open. 1. Pages 1, 4 and 6, adhere two 5 x 5 inch squares of Pink Paislee Sweet Cakes papers using Helmar V2 Vellum Adhesive. Embellish the pages with buttons, flowers, chipboard and tags using Helmar 450 Quick Dry. 2. Pages 2 and 5, attach two Pink Paislee Postcards one on each side of the page using Helmar V2 Vellum Adhesive. Add a Pink Paislee sticker to a tag and add to the layout using Helmar Liquid Dots. Embellish the pages with buttons, flowers, and tags with Helmar 450 Quick Dry. 3. Page 3, is the paper bag insert between the pages. Add a Pink Paislee Press Ons to the paper bag. Embellish several of the postcards and another cupcake with buttons using Helmar 450 Quick Dry then tuck them into the pockets of the bag. 6. Tie ribbons and tags on the binding rings. Helmar's Textured Effects is a fantastic way to add dimension to a project. It landed on my "favorite products" list the minute I opened the jar and started experimenting. In this project, I wanted to use an acrylic background, but I also wanted color to accent the beautiful paper from one of our preferred partners, Cosmo Cricket. I thought about coloring the acrylic itself, but didn't want the inconsistent look of alcohol inks. Finally, it occurred to me to color the Textured Effects itself. It worked perfectly! I used only a few coordinated products to let the texture (and color) shine. Following product instructions, apply a thin coat of Textured Effects to acrylic sheet using sponge brush. Allow to dry completely. In a seperate container, thoroughly mix Chalk ink with Textured Effects. Using sponge brush, spread tinted Textured Effects in a medium-thick layer over half of acrylic. Pull wisp brush through tinted Textured Effects to create striped texture on acrylic surface. Repeat steps 3 and 4 for other half of acrylic background. Allow to dry completely. Cut patterned paper and adhere paper, photos and chipboard shapes using Premium Craft Glue. The next time you'd like to add transparent color to a project, try this technique! One of the preferred partners for the Helmar design team is Scribble Scrabble. When I received the the Evelyn collection and was immediately attracted to the bright, fruity colors. I decided to use it to make these fun bangles!!! I was thinking about Mother's Day gifts when I started these, but as usual, I'll probably be keeping them for myself!!! I have always wanted to try my hand at jewelry making and when I saw these wood bangles in the clearance aisle at Hobby Lobby I thought they would be simple enough to try. Cut two strips of the Very Cherry patterned paper, one for the outside of the bangle and one for the inside. Next, use the Gemstone glue to apply pearls to your bangle, allow to dry. Use a soft brush to apply a coat of the Acrylic Sealer to the entire thing. Allow to dry. 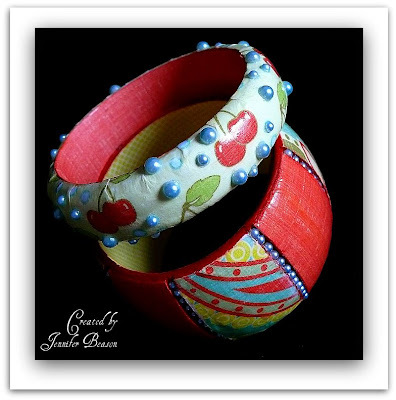 Paint both the bottom and top rims of the bangle with red paint, then paint all the grooves on the side of the bangle. When all the sections have been covered, trim away any excess paper with a sharp knife and touch up any painted areas that might it. 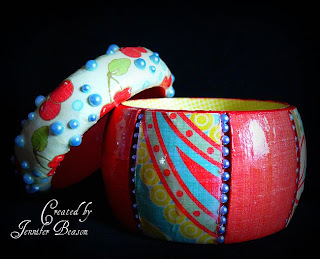 Using the Craft and Hobby Glue to apply a strip of the Lemon Lime patterned paper to the inside of the bangle. Use rows of pearls to embellish the grooves of the bangle. Coat the entire bangle with the Acrylic Sealer. The sealer will protect the bangle and it give it a nice gloss finish. I wanted to play around with one of the preferred products we (the design team) had recieved. I grabbed the Sweet 'N Sour collection from Scribble Scrabble. I had some wood pieces for a booklet laying in my drawer that I decided to alter. I grabbed my favorite glue, Helmar's 450 Quick Dry Adhesive, to use on the papers. The 450 doesn't buckle the paper at all. Nor do you get any bumps under your paper from the glue after it dries. The Sweet 'N Sour collection is double sided so I used both sides throughtout the booklet. The left side is from the sheet called Fruit Medley and goes with the front section. The right page is from the sheet called Tutti Frutti. Both are from the Sweet 'N Sour collection. Both pages here are from the sheet called Sugar Petals from the Sweet 'N Sour collection. Boysenberry from the Sweet 'N Sour collection. I had to use another Helmar favorite of mine in this little booklet. Helmar Gemstone Glue. I used the glue on the bottons that I added to the Laugh page. Notice how you can't see any adhesive through the button holes? Helmar Gemstone Glue dries clear for that very reason. The flourish is from the Sweet 'N Sour "chippers" (chipboard sticker with velvet flocking). I took distress ink to the edges of the wood and onto the paper to give it an aged look. I had the opportunity to make some projects using the Helmar Fabric Stiffener and Draping Liquid this month and I loved the versatility of this product! I decided to really try it out and use it on two different weights of fabric as well as two different sizes. I wanted to see how well it really worked. Let me tell you I was really impressed! I loved how I could mold and shape the fabric even throughout the drying process and even after the fabric was dry if I didn't like how shaped it was I could use my fingers and sort of relax it a bit. Such versatility with this product! This first project shows how I used a lighter weight of fabric and used it for dimension for a layout. I cut out a piece of 12x12 piece of fabric, covered it with the Fabric Stiffner and Draping Liquid and then attached it to my piece of cardstock. To give it some weight during the drying process I covered the fabric with wax paper and then put a book on top of it. Once it was dry I loved the shapes and creases that the fabric created. From there I was able to create my layout. I love how the fabric allows the rest of the embellishments and papers to really pop! For the second project I used a much heavier weight of fabric, burlap, and used it for a card. Using the same steps for drying as I did on my layout I found that the burlap wasn't going to pulled straight at all. Just a quick swipe of adhesive to the back of the fabric to attach it to my cardstock was all it took. Today I'd like to share a project that I just completed for a charity event. When I was asked to do this, my first thought was to paint the pig. Unfortunately, I couldn't get a nice even coat on the bisque ceramic, with the paints I had. So I decided to used paper instead. My instructions were also to make sure that everything was glued on securely. So of course, I knew this was a Helmar project!!! First tear the patterned paper into long strips, then tear those strips into smaller pieces. On my pig I didn't want any of the white core of the paper to show. To achieve this look when you tear your pieces, tear the paper towards you on all the edges. TIP: The patterned paper I used, although pink had various shades of pink and a subtle grid pattern, which I think added a little interest to the finished piece. Next cover the entire pig with the torn pieces of patterned paper using the Acid Free Glue. To make the process a little faster I took the lid of the glue bottle and used a medium sized brush to apply the glue directly from the bottle. Use scalloped strips of patterned paper to create the hooves on the pigs feet. The skirt is made by pleating a 1 1/2'' strip of patterned paper and then adhering it to a 3/4" strip of paper. TIP: You may have to glue an additional piece of paper to the pleated strip depending on your pleats, so the skirt is wide enough to fit around the pigs back. Apply the Acid Free Glue to the waist of the skirt (the flat part) and adhere it to the back and sides of the pig. I did not make the skirt go all the way around, it would have been a little too bulky! Use some of the Premium Craft Glue to adhere some felt rick-rack to the skirt. Next cut the prongs on the back of the rhinestone brads with scissors and use the Gemstone Glue to adhere them onto the pig to create the eyes. Cover the chipboard commas with patterned paper and then adhere to the pig's snout. Cover chipboard hearts with patterned paper and adhere to the pig's derriere using the Premium Craft Glue. Apply all pearls using the Gemstone Glue. Spray the entire pig with two or three coats of Crystal Kote Matte Varnish to seal and protect. Glue two matching chipboard crowns together with the Acid Free Glue (to strengthen). Then cover both sides with patterned paper. Coat one side of the crown with a thin layer of Acrylic Sealer then sprinkle with some glitter. When dry apply pearls to each point of the crown, then apply another coat of the sealer and allow to dry. Adhere thin strips of pleated patterned paper around the bottom of the crown. Then secure three roses around the crown by wrapping the wire stems around it. Use some Premium Craft Glue to hold in place. Crown your piggy, by adhering the crown to her ear using more of the Premium Craft Glue. Then secure by tying with a tulle ribbon bow.